We are living in a very violent world. Hatred, like garbage is strewn across the earth invading our lives and consciousness with its stench and disruption. I awoke to news of different kinds of violence. Three serial bomb blasts in Mumbai , yesterday July 13th and a news report of an innocent Pastor and his wife being beaten up and persecuted for the sake of Christ, in the western part of my state. In the evening I had to stand up to verbal resistance from Jags who is our church helper. He is a good man but suffers bad moods . I try to overlook this as he does a lot of good. All this disturbed me quite a bit but along came Milka (Pastor 's daughter) who wanted my help with her English assignments, letter writing and a news report. That eased my mind. She told me something which really amused me. Two days ago I helped her with another English assignment. Her teacher was so pleased with it that she dictated it to the entire class to note down. Har-har! Coming back to what I was writing about .The devil is not at rest my friends. He is assaulting the earth in many forms be it terrorism, angry blood thirsty mobs or a subordinate whom you have to deal with everyday. The Bible gives a very accurate account to today' s world . 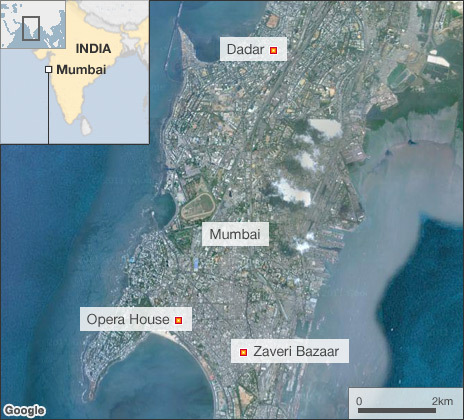 He called the explosions, during Mumbai's busy evening rush-hour, "a co-ordinated attack by terrorists"
One explosion was reported in the Zaveri Bazaar, another in the Opera House business district and a third in Dadar district in the city centre. Police sources were reported as saying the explosions were caused by home-made bombs. Dadar is one of the old areas of Mumbai, in the middle of the city. 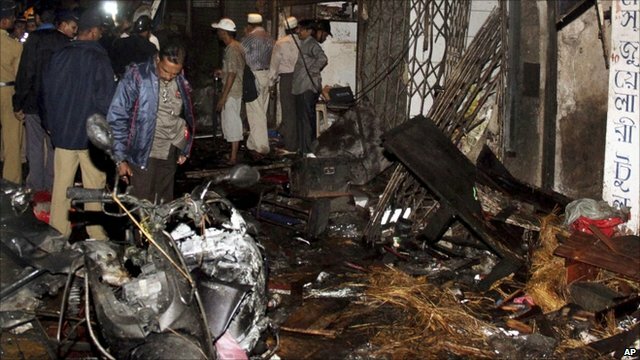 The blast here happened in a very crowded area with lots of shops and residential buildings. The blast here was not powerful. Police have said the explosion in Zaveri Bazaar was stronger. Police say the timing of the blast - 1900 - is significant. This was the height of the evening rush hour - it was designed to cause maximum panic and casualties. One person asked why Mumbai is always the target of attacks. However, many of the people gathered here now are merely onlookers curious to see what has happened. People have come from nearby areas to see what is going on. But in other parts of the city, the story is grimmer. There is panic and people are rushing back home. Prime Minister Manmohan Singh denounced the bombings and appealed to Mumbai residents "to remain calm and show a united face". US President Barack Obama strongly condemned the "outrageous" attacks, and offered "support to India's efforts to bring the perpetrators of these terrible crimes to justice". The latest explosions hit the city as workers were making their way home. The first struck the Zaveri Bazaar at 1854 (1324 GMT), tearing through the famed jewellery market, according to police. A minute later, a second blast hit the busy business district of Opera House, in the south of the city. At 1905, the third bomb exploded in the Dadar area of central Mumbai. Because the explosions occurred within minutes of each other, "we infer that this was a co-ordinated attack by terrorists", Home Minister Palaniappan Chidambaram told reporters. Mumbai had been put on a state of high alert and a commando team was standing by, he said. Delhi, the capital, Calcutta and several other cities have also been put on alert. Forensics teams have been sent from Delhi and Hyderabad to examine the explosion sites. The authorities have not yet said who they believe might be behind the explosions and no group has said it carried them out. In Zaveri Bazaar, witnesses described a motorcycle exploding next to a jewellery shop. Mumbai Police Commissioner Arup Patnaik said a bomb had been left in an abandoned umbrella. Photographer Rutavi Mehta told the BBC he was shopping nearby and heard the explosion. He grabbed his camera and ran to the scene. "I took a couple of photographs. I think they might be too graphic for broadcast," he said. "Bodies and limbs were strewn everywhere. People were crying and screaming. The area was packed with shoppers at the time of the blast. A few offered assistance to the blood-soaked victims, while others looked on in a state of shock," he said. "It was totally chaos. There were pools of blood everywhere." The second and most powerful blast was in the nearby Opera House district. Local media said it was planted inside the two-storey Prasad Chamber building. Mumbai has been targeted many times in recent years, most notably in 2008 In the central Dadar district, the bomb tore apart a taxi that was parked next to a bus stop, witnesses told the BBC. It was unclear whether the explosives were planted inside the vehicle or in a nearby electricity meter box. "I heard a loud explosion. And then I saw people with serious injuries lying in pools of blood," another person told the Times of India. An unexploded bomb was also reportedly been found in Dadar. The choice of locations makes it clear that the blasts were intended to cause maximum casualties, says the BBC's Soutik Biswas in Delhi. But footage of one of the blast sites - a ripped-off cover of a bus shelter and a car with its glass shattered - points to a medium-level and possibly crude explosion, adds our correspondent. According to some reports, the blasts came on the birthday of Mohammad Ajmal Amir Qasab, the sole surviving gunman from the 2008 attacks. But court records show his birthday to be in September. Those attacks, which targeted two high-end hotels, a busy train station, a Jewish centre and other sites frequented by foreigners, were blamed on the Pakistan-based Lashkar-e-Taiba militant group. Pakistan was quick to condemn the latest explosions, in a statement issued by the foreign ministry. Peace talks between Pakistan and India have only recently resumed since they were broken off after the 2008 attacks. Mumbai has been targeted many times in recent years. As well as the 2008 attacks, co-ordinated blasts on seven of the city's trains on 11 July 2006 caused massive loss of life. More than 180 people were killed and hundreds wounded in those bombings, which were blamed on Islamist militants. The city suffered four bomb attacks during 2003, including twin blasts on 25 August 2003 which killed 52 people. In 1993, 257 people were killed and 700 injured in a series of 12 bomb blasts across the city. The attacks were allegedly ordered by the Muslim-dominated underworld in retaliation for Hindu-Muslim riots. after he had an argument with his father, reported our correspondent. their own free will and nobody has forced them. Pushpanjali Hospital, Agra where they were admitted. against the perpetrators of violence. Amrita, I pray for you to have peace, for yourself and for your neighbors, and healing for the injured. How sad that the minister and his wife were accused and beaten. These are troubled times, you are right. I hope you find lots of good moments today, helping students and otherwise. "Jehovah, the maker of heavens and earth, bless thee out of Zion", Psalm 134: 3. I think the verses in 2 Timothy 3 give us a guide for exactly what not to be! Dear Amrita...I saw this on the news and immediately thought of you. I am praying for you my sister. The appalling events of July 13th do indeed reveal the devil at work. Violence fills the earth. Yet people long for peace. And, to top it all off, the conflict with your worker must be upsetting. I am glad you are there in the midst of chaos to provide stability and witness. The Lord has put you in that difficult place and He will keep your soul safe no matter what goes on around you. I read this on the Norwegian Internet. They said Muslims took "responsibility"
This is sad and appalling.I pray for Pastor Samuel and his family and for the congregation as well. I pray for my dear Indian Sister Amrita and her family. May God let his angels stay guard around you day and night. Amirita, this is so sad. Like the verse in Timothy, says ..people will become - treacherous, reckless, swollen with conceit, lovers of pleasure rather than lovers of God.... this all is true! My prayers for your country, the pastor and his wife and you. I came back from camp and I'm really tired, but I read this post... It showed me that persecutions are real. The time of Coming of Jesus is near. I will write more later (in this moment in Poland there is night). I greet You very heartly and we all from camp thank You for Your prayers! Yes, evil is so prevalent in the world today and acts of terrorism and religious persecutions are so widespread. Surely we must hold on to the Lord that we will be spared of all these evil happening in the world today. Yes, I will pray for you although I do not know for what purpose you are asking for prayers. The Lord knows everything. Thanks for the post. God bless you always.